Have you ever followed any dream? Any dream? A dream of swimming one full lap. Of getting a 20 on 20 in maths. Of determinedly making that dish that you forever screw up, one way or the other. Of having a perfect relationship. Of finally learning everything about that one passion that you were forever putting off, in favour of a more stable job, or "when do I have the time?" or "I'm too old for this now." We at the Bloggers' Table, were invited to International Institution of Culinary Arts, Delhi, to sample what following a dream can be like. A bunch of talented culinary students, under the guidance of so many talented chefs, cooked for us and served us Food of the Escoffier Era. That sounds too awesome for me to even process. To say it one line: some of the best food I've had, from one of the sweetest hosts. So worth it. A little about IICA here. As a lay person, what I liked the best about IICA, associated with the Indian Culinary Forum, is that there is no age limit. See that's what. That's what passion is all about. 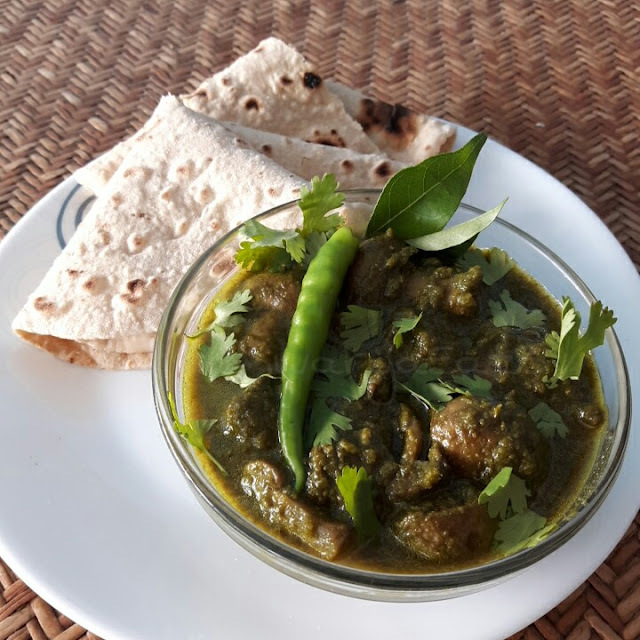 Founded by The accomplished Chef VS Datta of Oberoi Sheraton Hotels, ITC Hotels, Fortune Park Hotels, individual courses are accredited by Edexcel and City & Guilds. Some of the awesome courses on offer are Hotel Management, Culinary Arts. And courses for Hobby chefs in international cuisine, chocolate making and patisserie! Sid, Charis, Mukta, Tanya, Himanshu and I took a tour of the campus, peeked into the kitchens and saw our meal being prepared. Ample stomach rumblings ensued. We were greeted by the chefs at a beautifully set table with cold lemonade. Look, when a set menu greets us, and tells us what delicious awesomeness awaits us, it makes me happy. Not to mention hungry in anticipation. 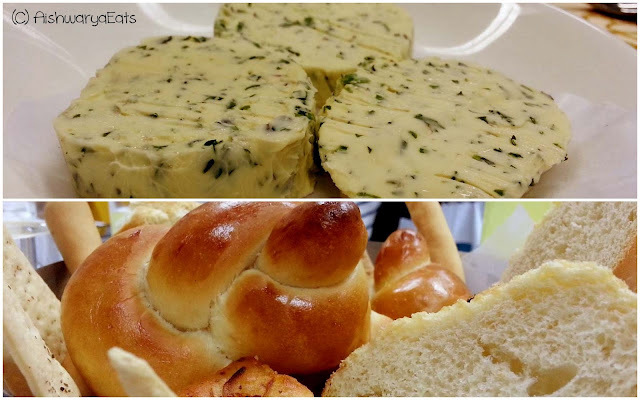 We started with house baked breads rolls, lavash and focaccia and pats of herbed butters. 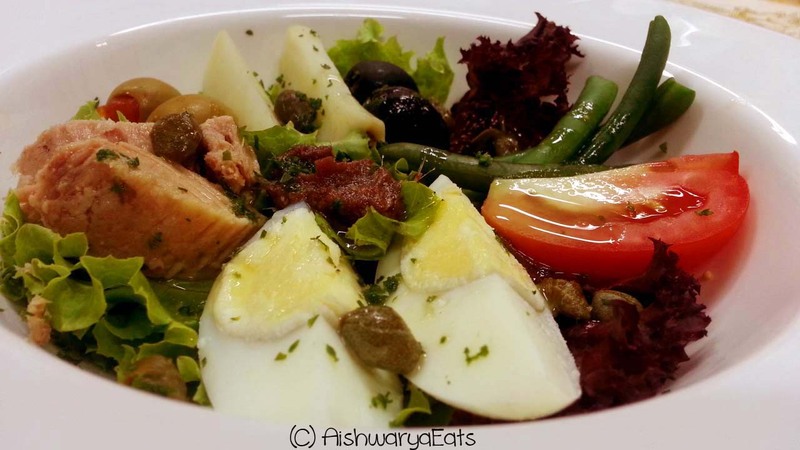 For La Salade, Salade Nicoise: quarters of boiled eggs and potatoes, chunks of tuna, fresh tomatoes, blanched green beans and a dollop of anchovies, dressed in a French vinaigrette on a bed of green and purple lettuce. The beans were crunchy, the vinaigrette light, the tuna solid and the anchovies- a solid hit of that salty fish got me on the way to an appetizing start! 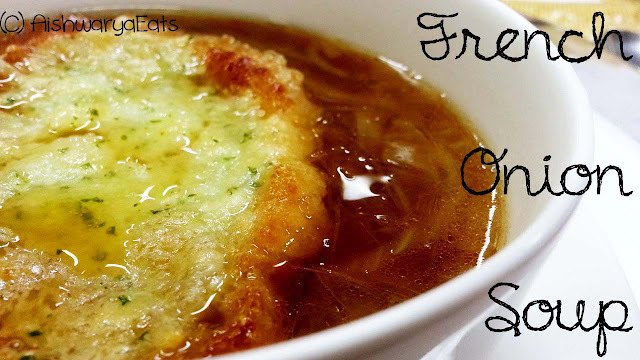 We followed it up with a Soupe a l' Oignon, which was an onion soup, garnished with a gratinated baguette topped with Gruyere. Arjun Datta, the COO of IICA informed us that replacing the beef broth of the onion soup was a more considerate chicken broth. 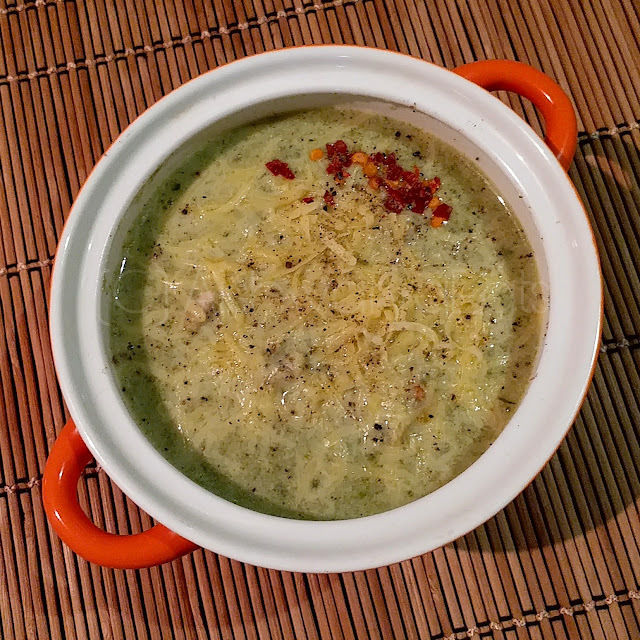 As appreciative as we were about that, I think the chicken broth lightened the soup, where it should be creamy and rich. I feel the baguette slice was also soaked for too long in the soup; it had becomes bloated and almost disintegrated, not having been held together with enough cheese. 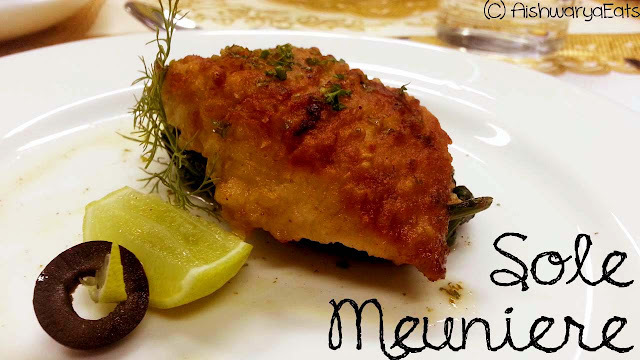 For our entree, we had the famed Sole Meuniere. Fillet of sole dredged in milk and flour, pan fried in butter, served with wilted spinach and a lemon butter sauce. It was, to say it in one word, the highlight of the meal. The fish was butter soft, yet firm. The flouring was just there, not forming a bread pakora like layer, yet there. The wilted spinach still had the green taste there, yet was not grassy. There was a beautiful wedge of lemon on the side, and a slice of a black olive hanging on to a tiny little horn from the lemon peel. Adorable and so so SO delicious. For the main course, or Le Plat Principal, there was Poulet Saute Chasseur. This was hunter style butterflied chicken with a bundle of vegetables and chateau potatoes and a hearty mushroom sauce. I got my favourite portions, a leg and a thigh. There's something about that portion that is so soft and melty, layers and layers of dark meat that has more flavour than the rest of the chicken combined! On this too, the flouring was fabulous, just melded together with the crispy skin. The chicken was tender and easily maneuverable with a regular fork and knife, which is saying something, since it was bone-in. (I was in absolute chicken heaven at this point). Yellow zucchini, cauliflower and carrots were bundled like a yakhni. The high point? The potatoes. The outside was crispy, and the inside was like starchy buttery clouds. It was so fluffy, I don't even have words to describe it. Me being me, I layered with herbed butters and noshed it down. Worth it. By this time, we were seriously full, but not heavy. This was debunking French food myths! Anyway, we were then served our dessert, a cold and dewy Mangue Romanoff. 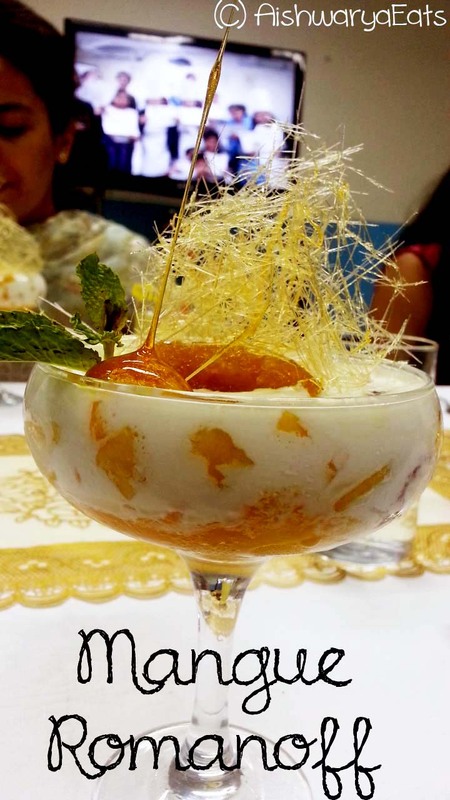 A cross between a trifle and a Dilli-wala fruit cream, it had chunks of sweet mango and quenelles of mango gelee swimming in lighter than air cream. This, was summer in a bowl. Everyone looked at peace again, simply because it was heavenly. Heavenly heavenly heavenly. And here's the catch. It was topped with two beautiful pieces of caramel. One was a long thin, VERY DELICATE stick of caramel, ascending vertically from a round shell of caramel. 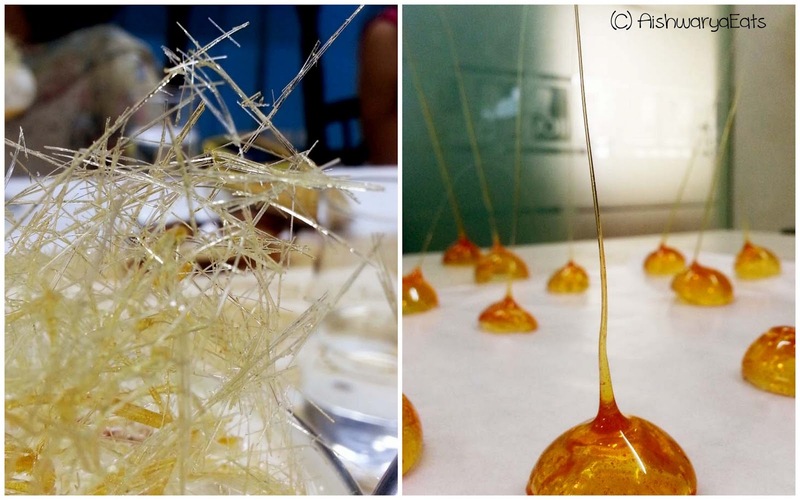 The other was a crispy, rather prickly nest of caramel strands. We witnessed the creation of both, and safe to say, creation of this requires a lot of hand control, control over caramel consistency and so much courage. And patience. Take a look! Our dessert goblets were licked clean, honestly. We were served tea or coffee, with the cutest petit fours I've seen. 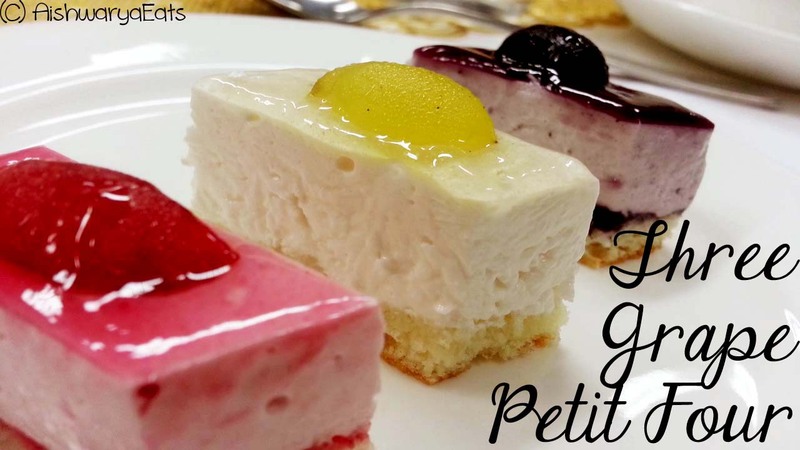 Tiny slices of cheesecake, garnished with three different grapes. They didn't taste much different to me. Even though I wanted to chomp up more of those, I just didn't have tummy real estate left anymore. 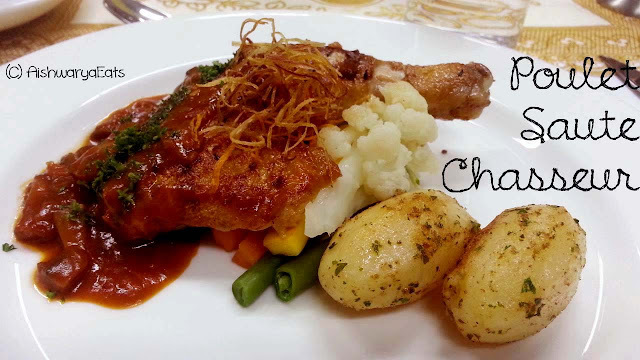 This entire course was cooked and served by the first years students of IICA, who are just four months in. Safe to say, and I know I speak for everyone else in our group, that this was one of the most worth-it Bloggers' Tables we've had. Follow your dreams, those are some of the few things that belong solely to you, and we must let our dreams get the better of us. Make a bucket list. Aim on completing them. One by one. One satisfied smile at a time. What delicious goodness. I really missed this one. Great write-up. You were really missed! It was a great lunch!